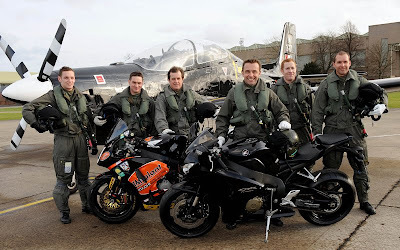 HM Plant Honda riders John McGuinness, Steve Plater and Glen Richards, swapped two wheels for two wings to get airborne with some of the UK’s flying aces and experience life as a fighter pilot, with RAF Linton on Ouse’s squad flying Tucano training aircrafts. Speed and machine performance, as well as strong physical and mental aptitudes are vital for both pilots and motorcycle racers, but the fastest man around the legendary Isle of Man TT mountain circuit, John McGuinness, experienced a whole new sensation of speed and physical pressures during the flight – highlighted by his lunch re-visiting him in the cockpit! McGuinness said: “The whole day was an amazing experience, not just the flying but also being with the pilots and all the people around RAF Linton who took such an interest in us and the bikes. "It’s a bit humbling really when you look at what they do. We took off from the base in York and it was just minutes before we were flying over my house in Morecambe - it took me almost three hours to drive from home that morning! “I’m used to riding at speed and having total concentration on a bike, but this gives you a completely different view and certainly a new appreciation for a pilot’s skill. TT and North West 200 road racing team-mate, Steve Plater, is no stranger to life in the sky as he is currently in training for his private light aircraft licence and has previously flown in an RAF jet plane. However, this proved no preparation for being strapped in to the Tucano aircraft, as Steve accidently set off a national RAF alert signal by activating the personal locator beacon in his life jacket - which usually signifies a downed aircrew! Plater said: “The whole day was awesome. We experience physical and mental demands on our bodies as well as fast speeds, but the speed is in a relatively confined space on a circuit so it feels so different in the sky where you have no reference points as such. "The forces on my body were unbelievable during the aerobatic manoeuvres we did and the whole experience is something you just can’t describe adequately. This was the first experience of its kind for Glen Richards, who took things in his usual laid back stride, although flickers of nerves couldn’t be hidden during the day. Glen said: “I feel very privileged to be able to come and spend some time with the RAF boys at Linton and go up in the plane. "I didn’t really know what to expect so I wasn’t nervous as such and although I enjoyed every minute of it. I was also pleased when we landed! “I’ve never done anything like this before and it’s an experience that I’m not going to forget. Flight Lieutenants Rich Keeling, Jim Whitworth and Chris McCann, the three Tucano RAF training pilots took off from RAF Linton on Ouse in a victory formation, and flew at low level - 250 feet above ground - at approximately 300mph over the Pennines to Morecambe Bay, before turning towards and flying through the Lake District. On the return journey the formation split in to three individual aircraft and climbed to 5,000 feet in approximately 90 seconds, to practice some aerobatics to include a loop the loop, barrel roll and stall turn. Flt Lt and basic fast jet pilot instructor, Rich Keeling, said: “A number of the RAF personnel on the Linton on Ouse base are interested in bikes and follow the British Superbike series. Click on 'The Bikes' logo to see more. A BIG... Thank You from Mick & I to all who helped to marshal on the day.. Signing On - will be from 1000hrs for a 1030 start. PLEASE can you reply to this email or acknowledge Facebook so that we know who will be there. Look forward to seeing you all on Sunday 15th.